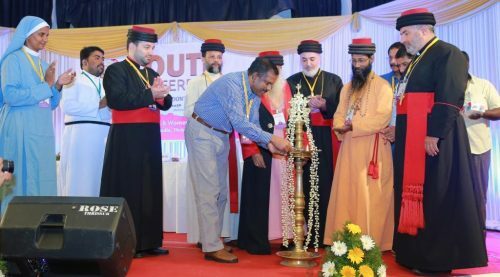 The Youth Conference – 2016 organised under the auspices of the Arch-diocese of India was held from 21st to 24thJuly 2016 at Thrissur, Kerala. ‘Get Up! Don’t be afraid’ (Matthew 17:7), one of the most emboldening words of Jesus to his disciples was the theme chosen for the conference with a view to encourage and equip the youths to face the growing challenges and concerns of the contemporary society. The four-day conference commenced with a registration of more than 325 youth delegates from across the world including USA, Australia, Iran and Iraq. The Inaugural session was presided over by: H.B. 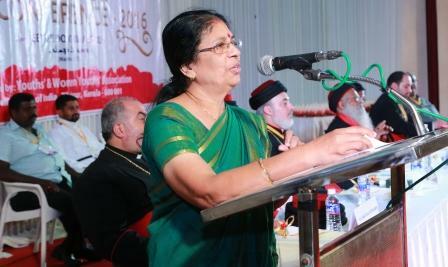 Dr. Mar Aprem, Metropolitan of the Archdiocese of India & UAE. H.G. Mar Awa Royel Bishop of California and Secretary of the Holy Synod, H.G. Mar Yohannan Yoseph, H.G. Mar Awgin Kuriakose from India, H.G. Mar Narsai Benjamin Bishop of Iran and H.G. Mar Paulus Benjamin, Bishop of Eastern USA, were the other prelates present. His Beatitude enlightened the gathering with a bird’s eye view on the history of the Church of the East and also encouraged to spread the faith and be responsible witnesses to the church established in 52 AD by St. Thomas the disciple of Jesus Christ. Mr. Ajith Kumar IPS officially inaugurated the conference urging the youth to just capture only as much information that is required from media, internet and other sources and to stay away from overloading of information. He also emphasised that such conferences should enable the youths to identify their hidden and inborn talents and to use them for the betterment of their own lives and the lives of others. H.G. Dr. Mar Awa Royel rendered the keynote address and offered inspiring thoughts on the significance of the Church and what it calls to be real members/faithful of the church. 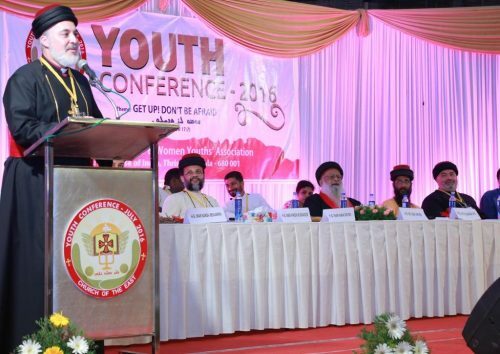 The India Youth Conference was felicitated with a formal letter of greeting and blessing from His Holiness Mar Gewargis III Sliwa, Catholicos-Patriarch of the Assyrian Church of the East. His Holiness was not able to attend in person, but extended his blessings to the Conference and expressed his keen desire to visit the Archdiocese soon. First and foremost: receive the peace of our Lord and Savior Jesus Christ, and our greetings and the greetings of our faithful in Iraq. I was truly desirous to have participated with you during this joyous celebration of our holy Church in the blessed land of India. However, sadly I was unable to be present in person because of my physical health, and the fact that I had to undergo an unexpected surgery. Thanks be to God, I feel much better now and am slowly recovering. Therefore, I ask your prayers, that the Almighty might give me the necessary strength and health soon, so that I may in the very near future travel to your country and visit our beloved faithful. Without a doubt, our holy Church has labored in the past and continues to do so in the present with the aim of spreading the ecclesiastical, spiritual and cultural heritage amongst the youth wherever they might be living. Because the youth are the pillars of our Church’s future, she continually encourages and strengthens them to be diligent in putting forth conferences which will benefit the worthy goal of every stage of their lives. Undoubtedly, your present conference will enable you to draw in the youth of the Church who have marginalized themselves. Therefore, it bears upon the shoulders of our holy Church to support and promote such activities in order to be a source of advancement and progress for our youth, and thus to be the cause of a connection and dialogue among our youth. This will enable them to be active in every facet of the Church’s life, and better equipped to carry on the progress in our present age, in a worthy manner. 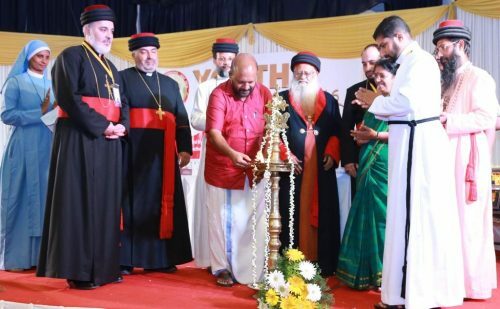 I offer my thanks to His Beatitude Mar Aprem, and to Their Lordships Mar Yohannan and Mar Awgin for their care concerning this worthy activity, and to every clergy and faithful of our faithful in India who have contributed and helped the Youth Conference to be become a success. I also greet all of the guests of this conference at large, and in particular those guests who are participating from divers countries outside of India. The second day of the Conference unwrapped with a Bible Study session by H.G. Mar Yohannan Yoseph who related the theme to the restoration of the body through the story of the woman who was sick for 12 years (Matthew 5:25) and the restoration of the soul through the story of Zacchaeus (Luke 19:1-10). The 1st session, the Theme presentation by Fr. Jerry Kurian from the United Theological College Bangalore propelled the youths not just to ‘be good’ but to ‘be good enough’. He highlighted the culture of youths today urging them to befriend Jesus who gave His life for us. Also encouraged them to get involved in key decision making bodies in the churches as youths are the key change agents. H.G. 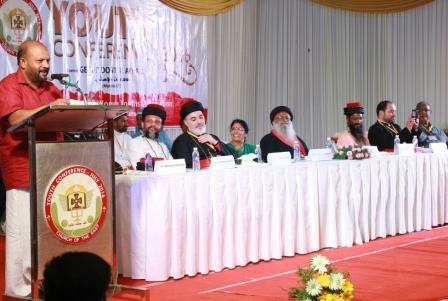 Dr. Mar Awa Royel offered profound insights on the subject “Saints in the Theology of the Church of the East.” His Grace enlightened the youths on the meaning, ecclesiastical recognition, canonization and the veneration of saints, rendering a holistic view on the relevance of saints in our Church. This session was followed by H.G. Mar Paulus Benjamin who exposed the delegates to the various Challenges, Struggles and Vulnerabilities confronting the Church today. His Grace highlighted the adverse impact of Globalisation, Modernisation, Secularism, Consumerism and also encouraged the youths to live by the apostolic tradition and teachings of our fore-fathers. The Indo-Assyrian Cultural night was a delightful time of singing, dancing and sharing the culture of the fellow youths including Indians, Assyrians and the Philippines. Day 3 was hosted at YMCA Youth Centre, Kannara, a site known for its calm, aesthetic beauty and serene atmosphere. The day commenced with a Bible study by H.G. Mar Awgin Kuriakose who challenged the youths on the definition of love, spoke on the aspects of ‘Fear’ and ‘Fear Not’ from a biblical perspective and also encouraged them to boost up their faith to be bigger than their fear. Fr. Abraham Thomas from the Orthodox Theological Seminary, Kottayam, emphasised on the ‘Free Will’ of the youths to respond to the encouraging words of Jesus ‘Get Up! Don’t be afraid’. He compared the event of transfiguration as an experience of a journey of ascension, witnessing, fellowship and prayer leading to freedom from fear at the mount of transfiguration and to descend back into the world to work for His kingdom without fear. Rev. Dr. Aphrem Alkhori created awareness among the youth regarding the Canon Law of the Church of the East regarding marriage, engagement and divorce according to the Nomocanon of Mar Abdisho of Nisibis (d. 1318). Prof. C. Raveendranath, Honourable Minister for Education, Government of Kerala educated the youths on bio-diversity and the relevance of preserving the environment for maintaining an ecological balance. The day ended with a campfire with all the youths joyfully exhibiting their inborn talents of singing and dancing. 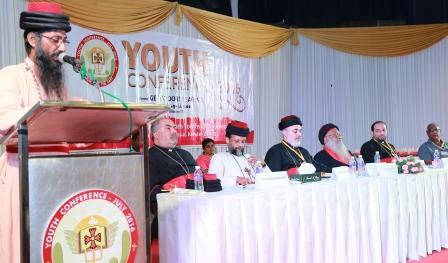 Day 4 of the youth conference commenced with a Holy Qurbana con-celebrated by all the prelates, with H.G. Mar Narsai Benjamin as the main celebrant, at Marth Mariam Big Church, the Cathedral of the Church of the East in India (Thrissur). The youth later visited the Poomala Dam which is used mainly for irrigation purposes and also the Church Seminary at Thiroor. 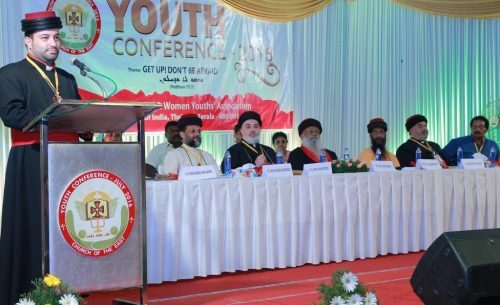 The Youth Conference – 2016 ended with a Valedictory function presided over by H.B. Dr. Mar Aprem Metropolitan in the presence of distinguished dignitaries, Bishops from India, USA and Iran, members of the Board of Central Trustees and special invitees from south Asia. Guests of Honour at the function were Honourable Minister for Agriculture Adv. V.S Sunil Kumar and Mrs. Ajitha Jayaraj, Worshipful Mayor, Thrissur Corporation. 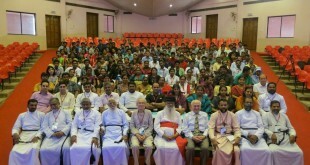 During their sojourn, the three bishops from outside India, accompanied by Their Graces Mar Yohannan and Mar Awgin, paid visits to the Indian Church’s various institutions, namely: the Mar Timotheus Hospital, the Archdiocesan Seminary, the Mar Timotheus Memorial Orphanage, the Old Age Home and the newly constructed Mar Dinkha IV Convent on the grounds of the orphanage. The new convent will have the capacity to house six nuns, and includes a chapel, common room, refectory and library. Later, the bishops paid a friendly visit to the St. Ephrem Ecumenical Research Institute (SEERI) in Kottayam, and were received by the Rev. Fr. Dr. Jacob Thekkeparampil. Afterwards, the bishops proceeded to the Indian Orthodox Theological Seminary in Kottayam, and were formally received by Rev. Fr. Dr. Baby Varghese and Fr. Dr. Abraham, who had addressed the Youth Conference in a formal talk. At the Seminary, the bishops had the chance to address and interact with some of the faculty and a number of the student body, in addition to visiting the chapel and venerating the relics of St. Thomas the Apostle. From the Seminary, the bishops proceeded to the Catholicate of the Malankara Orthodox Church in Kottayam, and were received by His Holiness Catholicos Baselius Marthoma Paulose II. The Assyrian bishops extended the formal greetings of Catholicos-Patriarch His Holiness Mar Gewargis III, who was schedule to visit Kerela and to be received officially by the Malankara Catholicos. In return, the Catholicos extended his fraternal and sincere greetings to His Holiness Mar Gewargis, and expressed the desire to receive him soon in Kottayam. 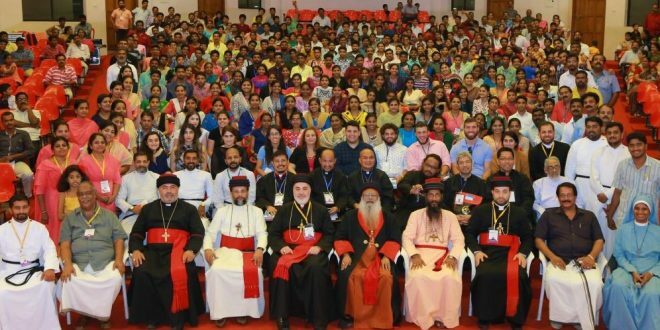 On the evening before the return of the Assyrian bishops and the youth delegates outside of India, the metropolitan and bishops had the chance to address the clergy of the Archdiocese of India, and to interact with them in a question-and-answer session, along with a photo session and a common meal together. Some 35 clergy were present for this fraternal meeting. Yet another historic event came to an end offering great appreciation to the organisers especially the convenors Dr. Sr. Jincy Othottil and Fr. Tinto Timothy along with the team who toiled from dawn to dusk for the success of the conference and also to all delegates both from India and abroad for their active participation and co-operation all through the conference. Youth dispersed imbibing the theme ‘Get Up! Don’t be afraid!’ and also hoping to meet again for the next youth conference (2018). Next Assyrian Delegation Attends Conference on Religious Freedom in Washington, D.C.